2.0 mi east of Frederick, and 16.9 mi upstream from mouth. 231.21 ft above North American Vertical Datum of 1988.
platform at station. Water-quality records for some prior periods have been collected at this location. minimum discharge, 17 ft3/s, Sept. 11, 13, 1966. 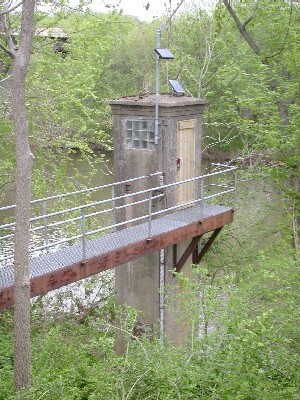 This station managed by the MD-DE-DC Water Science Center Frostburg office.